Trying to clear out of some cards from past years to help inspire new designs and hopefully increase production. Head over to my sale page to catch some bargain cards - maybe you'll even snag some of the remaining valentines! New lino-cut thank you notes with kraft paper envelopes from last week's show. Although I really love carving stamps by hand, I currently prefer printing them with ink pads rather than block printing ink. Who knows, I may return to the traditional way if i decide to use a light ink on darker paper (and have room to spare on the floor while they dry), but for now this is oh so convenient. Oh, the beauty of being able to change my mind! I'm hoping to get them up in my etsy shop for the new year, along with a selection of sale cards from past seasons. Everyone loves a good deal, am I right? And some photos from the RIT winter show last week. A tiny original painting from last year that I finally framed. it's free shipping time, friends! I know I've said this before, but I quite dislike venturing out for holiday shopping. Too many people in a hurry. Too much time wasted, thinking the perfect items are going to jump out at me as obvious gifts for people I love. Sometimes it happens so easily like that. It does. But more often I come home after having carried something around the store for far too long, only to put it back on the shelf and leave. I have to admit, for the last few years I've been taking a more comfortable route; sitting at my computer in my sweatpants with a mug of coffee, clicking on the shopping cart icon, and waiting for my presents to show up on the doorstep. As an added bonus- it's so much easier to enjoy the snow when I don't have to scrape off my car and drive through it. Liam agrees with me. So here's my gift to you, friends: free shipping on anything from my etsy shop until the new year- weee! Ornaments, cards, prints, gift sets, pure joy. Go on and find something for someone (or for yourself)! In the spirit of the online shopping spree tomorrow, I will be having a sale in my etsy shop for 25% off! Head on over, see if there's something to bring joy to your world, and save money while you're at it. win win win! Redeem the code below - good for Monday 11/26 only. This week, Liam got a little blister on his toe from all the jolly jumper excitement. Not a moment too soon, I decided he needed some shoes to wear (they will likely help him hop to unprecedented heights). The pattern is from Twirlybird on etsy, and was so easy to follow. I made them out of some denim I had from a pair of old jeans. I am dying to make her hightop boot pattern, too. That little boy might need a few pairs of each! One of my newest wedding calligraphy jobs: navy ink on square envelopes. Love how classic these turned out! I am so unbelievably excited to see this invitation suite- the bride is featuring my calligraphy on the invite & enclosure cards alongside her bridesmaid's hydrangea pattern designed pocketfold. I'll be sharing more photos of the ensemble after their big day. Made this little gold doily for my parents' 30th wedding anniversary. Kudos to those two love birds for finding the secret to staying happily together for so long- they just create fun times! Calligraphy for my talented friend Meredith's wedding, and a special envelope for the lovely bride herself. A tea party bridal shower invite. Trying to mix things up a bit with some asymmetrically punched corners! I'm really really pumped about etsy starting a wedding registry! I've been hoping to make some more printable invitations for my shop, and anticipate a large number of brides visiting etsy with this new feature. Getting married? Go check it out and register for some awesome handmade items for your home! My grandmother passed away last weekend. We've been reminiscing about cherished memories lots, but mostly thinking about the new life that she is enjoying now. She will be missed dearly. Below is a program cover I did in her honor for the service. I finished a really neat wedding calligraphy job last week. The inner envelopes were kraft paper pocketfolds with a chocolate ink, and the inner envelopes were brown with a 'bell bronze' metallic ink. Is it silly of my to be geeked out about this? This wedding ensemble is for the sister of a dear friend, who wanted a rustic themed invitation. Made a second version of the adorable aviator hat from a few posts ago for Liam for next winter. Here's to new life this spring! Spring is here, yay! Time for bright colors and new projects. These carnations are some of the prettiest I've seen, from my birthday. The fuchsias, magentas, & corals are seriously gorgeous. The best part? They are STILL thriving! Lots more time to enjoy these blooms. I'm so excited about every detail that has gone into this wedding suite. I recently completed some extras for this awesome bride, including a program cover, table number graphic, monogram, and several additional motifs for around and about on her wedding day. The dog and cat illustration features Bryanne's own Daisy and Nash. An upcoming calligraphy job. Brown ink on kraft pocketfolds, and light bronze ink on chocolate envelopes- so pumped to get started! An etsy request for a new Avett Brother's print. Even though warmer weather is here, I couldn't resist one last cowl for the season. This one was from The Velvet Acorn on etsy. Most of her patterns are available in both adult and child sizes, so of course next year I'll be making a miniature for Liam. Wanting to share a hat that I made last week- my first attempt at fair isle, which ended up being a lot easier than I expected. This pattern was also from the purl bee. I'm excited to try charting out my own patterns to create. The aviator hat below is one that I made for Cecelia's son Freddie's first birthday. The original pattern was from etsy, and I altered it with the stripes at the top. Hoping to get this to him and snap a shot of that cute little boy soon. Modeling a cowl that I made recently for a wonderful friend's birthday. This pattern was from one of my favorite knitting/sewing/embroidery sites, the purl bee. This is the second one I made, and I love how it turns out. Seriously, go make one. You won't be disappointed. And how awesome are the colors of Amazing yarn? I mean.... come on. Another recent favorite wedding invitation suite for a bride that I met at the RIT alumni craft sale. This was my first time including a map, which I had a lot of fun with. I like the contemporary vintage (if that's possible) theme that she has going on. Getting pretty excited to share some new knit projects soon. And perhaps a new Avett Brothers print too. I wanted to share some beginnings of a very pretty invitation suite that I'm working on. The ensemble is so fun to work on, featuring enclosure cards with different patterns and complementing designs that make one very unique invitation. The RSVP card even features the bride and groom's adorable dog, Daisy. I am so excited to get working on the program and table numbers! This is just the sweetest little thing I've seen lately. Michael and I picked one up for our baby while at the holiday Hearts & Crafts show on Sunday. Made by sweetpeafelts, this delicate little bundle sits in half of a walnut shell. PRECIOUS! 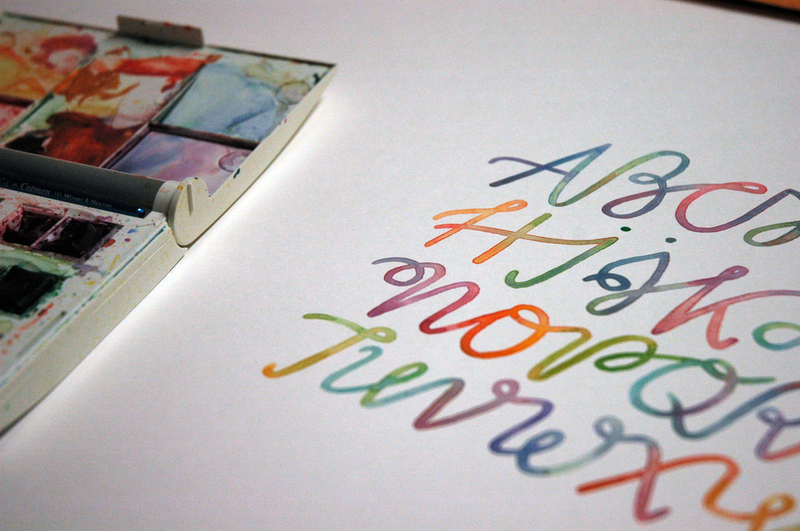 So proud to share the completed greengirlpress calendar for 2012, featuring my calligraphy, and Amy's beautiful design. Each calendar varies slightly, as she individually watercolored each one- so cool! A tiny little blanket for my friend Emily's sweet little baby, due this spring! I love this camel color for her. Hello, all! It's been an absolutely crazy few weeks, between moving back to Rochester and several recent freelance jobs. I'm happy about the recent pace of things, and hope that this busy-ness continues for a bit! Firstly, Hearts & Crafts is rapidly approaching again! I'll be doing my best to create some new pieces for this show (assuming I can find where my box of essential supplies and paint is hiding). I'll have a table on the second day- so excited to be in the same show with Cecelia again. :) Do come visit. The last wedding calligraphy gig that I finished was a blast! I got to try my hand at reproducing the 'engravers' font to match the bride's Paper Source invites- something that took me 3 pens for each envelope to manage. I am really happy with the way that they turned out, though they still have that 'consistent inconsistency' to them. Seriously, how awesome are Waste Not Paper envelopes? WAY pumped to get started on their 'night' color envelopes with my white ink for this week's etsy gig! Finished the most adorable baby shower invitations for my cousin today, using a template found in this post on the wren handmade blog. It was adapted slightly to fit some blue envelopes I had here. Lastly, a look at the progression of my baby granny square blanket. My new love: gray for nurseries! The Hearts & Crafts show this weekend was a great success! We had a lot of people come out and wander through. The space was fun to work around at Java's, since the tables were quite tiny. I found an old washboard with shelving in it (and a lot of character) at Goodwill last week, which worked out perfectly for some smaller items and received many compliments. I shared a cozy corner with some really nice vendors, and swooned over many others. Sam makes charming vintage button accessories. I also got a truly wonderful calendar from Amy at greengirlpress. Looking forward to a few more shows this spring, and trying to talk myself into one of Carla's "fabric cutter upper and piecer backer together-er" scarflettes like this one! Today was a blessing in that I had the option of going out in the cold, or staying parked in the driveway. Of course, I stayed in and had quite a productive day. I had a set of birthday cards and thank you notes to finish for a custom order, which were fun to do. Half were original watercolor illustrations, and the thank you notes were printed from a hand cut lino block. I haven't been overly happy with the last bunch of blocks I bought. They seem dry, and with the compressed wood on the back, don't print well. Last week I thought I'd test out one of my old illustration concepts with the Speedball Speedy-Curve blocks. I'm already much more satisfied, just after the first 10 prints. I plan to sell them in February at the Hearts and Crafts show at Java's on Gibbs St. The word bubble will read "you're steamy". A fun piece that I finished up last night of a nice little song by Mason Jennings, by special request from a fellow Royal Tenenbaums fan. I love how the cross hatching in the sun turned out, despite the simplicity of it. This is a print that I just made custom for someone on etsy. She is giving it as a wedding gift. Stay tuned for many neat things coming in the (near) future! This is a calligraphy piece that I did for a very loyal customer of mine on etsy, Bria. I love getting ideas for custom jobs from her, and I'm always happy with the results. She's got some great style!